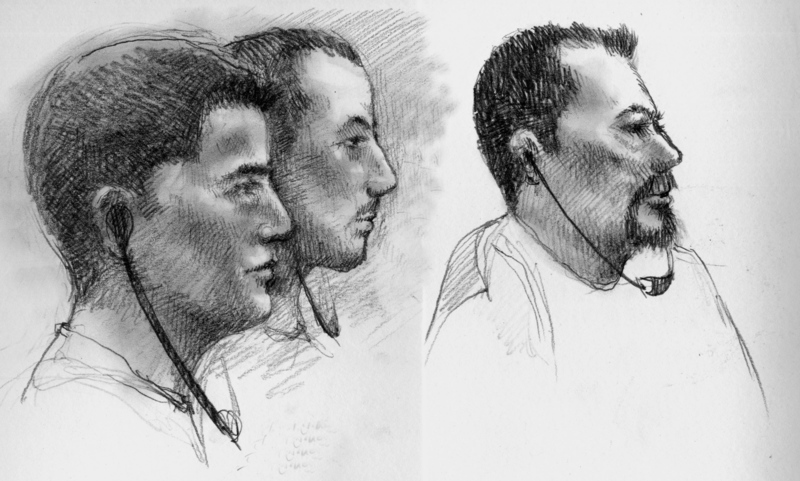 Ten men stood before U.S. Magistrate Judge Leslie Bowman in federal court in Tucson, Arizona. They still wore the clothes they’d been captured in — sun-bleached T-shirts and sneakers dusted with sand. The chains on their hands and feet clinked as they teetered before the bench. Judge Bowman read them their rights en masse. Then she questioned each man individually before accepting his plea. 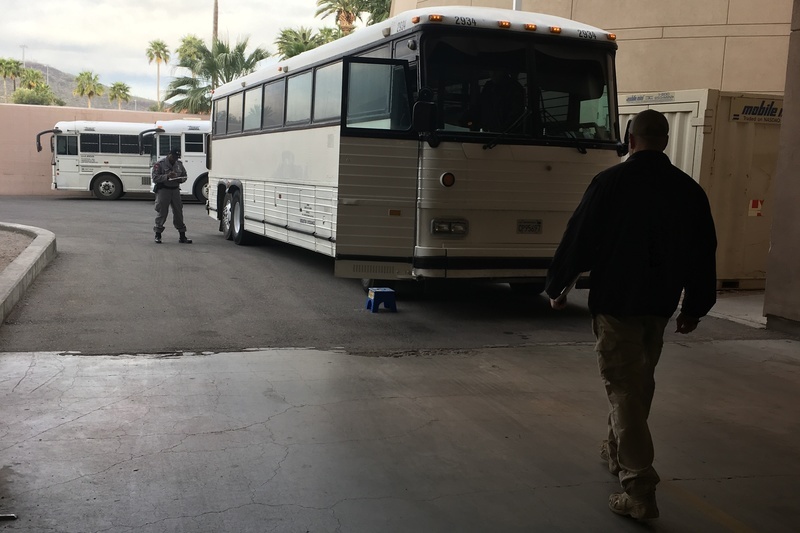 Defendants with a clean record got time served for the misdemeanor of illegal entry and were then sent to immigration detention to await removal proceedings. Those with criminal records from previous border crossings had signed plea deals agreeing to serve time for the misdemeanor charge. In return, the prosecutor dismissed their separate felony charge for illegal reentry. Their sentences ranged from 30 days to six months. Once they’d left the room, a new batch of 10 shuffled to the microphones, their court-appointed attorneys huddling around them. Judge Bowman read their rights again. In this way, 72 cases were decided in the span of two hours. This is Operation Streamline. The program, practiced in every border state, is meant to deter illegal immigration with criminal charges that can send people to federal prison before they face deportation proceedings. But the process has long raised concerns among attorneys and policymakers about whether each case gets adequate attention, and if individuals truly understand the charges against them. As the hearing in Tucson played out on April 4, a shake-up was brewing at the U.S. Department of Homeland Security, which handles immigration enforcement. President Donald Trump withdrew his nomination of Ron Vitiello to lead U.S. Immigration and Customs Enforcement, saying he wanted someone who would take the agency “in a tougher direction.” Days later, DHS Secretary Kirstjen Nielsen resigned. The Trump administration has already left its imprint on the 14-year-old Streamline program, which could grow under a “tougher” immigration policy. Even after Streamline came to Tucson in 2008, Border Patrol, part of DHS' U.S. Customs and Border Protection agency, would drive some of its wards back across the border to Mexico without formal immigration proceedings, let alone criminal prosecutions, according to Chief Judge G. Murray Snow of the District of Arizona. The number of people arrested for unlawful immigration has been climbing. Border Patrol apprehended 103,492 inadmissible immigrants in March, the highest monthly total since 2007. But illegal immigration rates are significantly lower than they were in the 1980s, 1990s and early 2000s, when Border Patrol arrested about 1 million migrants along the southwestern border every year. In the 2018 fiscal year, the agency reported 521,090 apprehensions. Meanwhile, prosecutions of criminal immigration offenses have increased. Before Streamline, in 2003, there were 4,095 cases where the lead charge was illegal entry. That shot up to 49,663 prosecutions in 2008, once Streamline was in full swing. Since then, it’s again increased by 25 percent, to 62,185 prosecutions in 2018, according to Syracuse University’s Transactional Records Access Clearinghouse. Streamline has its origins in Del Rio, Texas, where in 2005, Border Patrol agents frustrated by “catch and release” began charging immigrants. Those charges, and the hearings meant to efficiently process them, became national policy after President George W. Bush rolled out his immigration agenda in 2006. During the Obama administration, multiple due process appeals helped reshape the program. Ninth Circuit panels have found a court can’t advise 45 people at once of their rights, that there can’t be a lag between an offender hearing his rights and entering his plea, and that defendants can’t plead in unison. Since his campaign, Trump has promised hard-line immigration reforms. Operation Streamline has proven key to this policy. 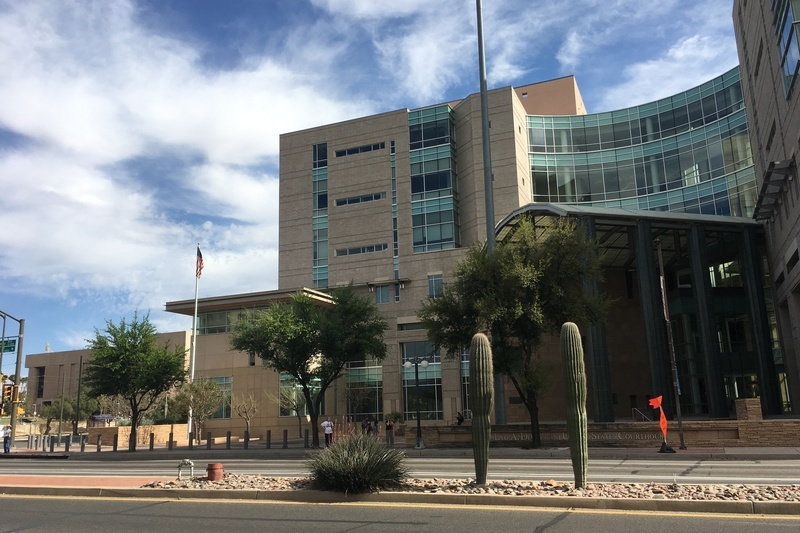 Prosecutors in Tucson then redoubled efforts to bring misdemeanor illegal entry charges against people with no criminal record, according to Assistant U.S. Attorney Nicole Savel, chief of the Tucson criminal division. When Streamline began there, the focus had been on first-time offenders, she said, but it shifted to defendants with criminal records during the Obama administration. “Then, in response to the 2017 immigration enforcement memo, we did begin to prosecute first-time entrants in Streamline again,” she said. Last spring, Sessions announced a “zero-tolerance” policy, instructing U.S. attorneys to prosecute all immigration cases — not just illegal reentry, but first-time entry charges. Deputy Chief David Smith stood on the courthouse’s loading dock, where buses transport about 200 prisoners a day. The dock is penned in by a terra cotta-colored concrete wall. A few spindly palm trees peer over it. When the bus carting that day’s Streamline prisoners pulled in, they lined up along the sally port. The marshals called them up one at a time, patting them down, checking their shirt collars and the backs of their throats. Their shoes had been stripped of laces. Tucson is the busiest U.S. Marshals Service suboffice in the country, Smith said. It costs the Marshals Service $65 million annually to process and detain Streamline prisoners, according to a 2015 DHS report. At the lockup, prisoners were photographed, fingerprinted and screened for medical problems. Then they were taken to Judge Bowman’s courtroom, where four defense lawyers sat at counsel tables, murmuring in Spanish in one-on-one meetings with their clients. The other prisoners sat in the gallery, awaiting their 30-minute consultation. Attorneys first assess their clients’ Spanish proficiency. Many speak indigenous languages and can’t understand the charges against them. In one hearing, 14 of the 72 defendants saw their charges dismissed for this reason. After Spanish speakers are advised of their charges and trial rights, the attorneys ask their clients where they’re from, why they left and whether they could have derivative U.S. citizenship through a parent. They discuss possible asylum claims, which the attorneys will enter into the record, hoping they’ll be taken up in immigration court. One of the defendants that week had fled Guatemala, where organized crime and gang-related violence led to a 25% spike in immigration between 2007 and 2015, according to the Pew Research Center. For one week, the man had trudged through a stretch of the Sonoran Desert known as the Devil’s Highway, where 400 to 2,000 people die of thirst per year. He’d planned to walk 40 miles to Ajo, Arizona. He was 65 years old. He was sentenced to 30 days in prison, she said, because he’d crossed the border before. Streamline’s critics, like Ruben Reyes of the American Immigration Lawyers Association, say the program’s deterrent effect isn’t as powerful as the violence, corruption and poverty that drive people to cross to the U.S. border again and again. “If the option is, ‘We’re going to lock you up or you’re going to die,’ most people are still going to choose to be locked up,” Reyes said. But without prosecution, there can’t be any deterrent effect at all, according to Andrew Arthur, a former immigration judge and fellow at the Center for Immigration Studies. He added that Streamline’s efficiency doesn’t harm defendants’ due process rights, because they get attorneys to defend charges which aren’t very complicated. “They either entered illegally or they didn’t,” he said. “I think we do a pretty good job of making sure they’re making the best decision at their disposal,” Bacal said. “It’s not pretty. It’s not justice at its finest in action. Neither is arraignment day in New York City court,” he added. With the shake-up at Homeland Security signaling a “more aggressive immigration enforcement approach,” Streamline could soon see an expansion, according to Seth Grossman, former deputy general counsel at DHS. He says that even under its family separation policy, the Trump administration wasn’t criminally prosecuting everyone who entered the country unlawfully, and it will likely push for more criminal immigration cases. “They could detail other U.S. attorneys from other districts in the United States to those along the border, so there would be even more prosecutors devoted to pursuing these offenses,” he said. Representatives for the U.S. Department of Homeland Security and U.S. Customs and Border Protection did not respond to inquiries about Streamline’s future. In Tucson, the daily defendant maximum for Streamline was recently increased from 70 to 75. The court used to refrain from holding Streamline proceedings on the same day as naturalization ceremonies that take up the courthouse’s biggest room. That changed in January. Now, as some immigrants get their citizenship downstairs, 30 prisoners are charged with the crime of illegal entry.